Lastest case study about IBR in South Island dairy herds. Click HERE to downlaod full case study by Ivan Holloway. INFECTIOUS BOVINE RHINOTRACHEITIS (IBR) is caused by bovine herpes virus Type 1 (BoHV-1), which also causes two other conditions in cattle – Infectious Pustular Vulvovaginitis (IPV) in cows, and Infectious Pustular Balanoposthitis (IPB) in bulls. Neither condition is desirable to have at mating time! IBR is considered a highly infectious and contagious upper respiratory tract disease, characterised by rhinitis (snotty nose) tracheitis and fever. Infection is lifelong, with periods of latency and recrudescence. 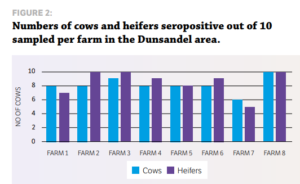 Historical serological surveys have suggested IBR is widespread in both dairy and beef herds of New Zealand (Fastier and Hansen, 1966; Neilson and Grace, 1988; Motha and Hansen, 1998). 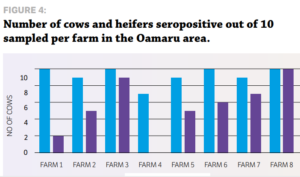 Over the last 20 years, dairying has grown rapidly on the east coast of the South Island, so the question arises as to whether the prevalence of IBR in South Island dairy herds has changed at all. Agilis tried to answer that question through a small serological survey of dairy herds serviced by Vetlife in Mid Canterbury and North Otago during the spring of 2015. 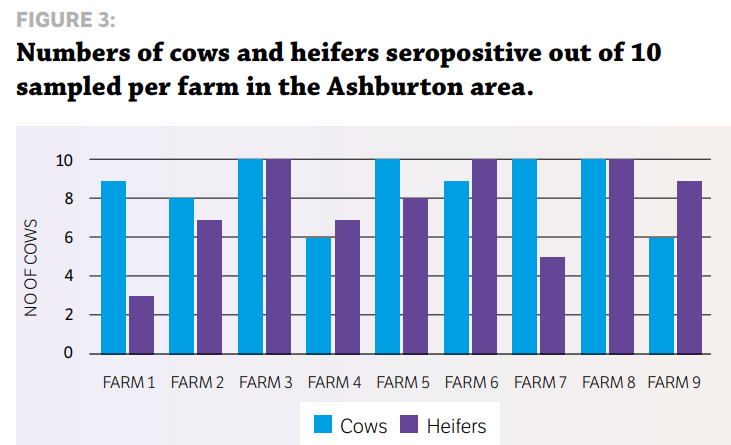 STUDY DESIGN Eight dairy herds from the Vetlife Dunsandel and Oamaru catchment and nine herds from the Vetlife Ashburton catchment participated in a small crosssectional serological survey to ascertain the level of IBR infection. The only exclusion criteria was that the cows had not previously been vaccinated with an IBR vaccine such as Hiprabovis 3. Ten mixed aged cows and 10 first-calving heifers were randomly sampled during milking, with a clean vacutainer needle used for each sample. Serum samples were analysed at Gribbles Veterinary in Christchurch for IBR antibodies using the IBR enzyme-linked immunosorbent assay (ELISA). All blood testing was carried out during routine farm mineral testing visits. RESULTS » All farms were seropositive for IBR. » Every farm tested had at least six of 10 cows positive for IBR exposure as measured by antibody response. » Only one farm had heifers that had not seroconverted at testing after apparent IBR exposure. More cows were exposed to IBR than heifers (87% cows vs 72% heifers). 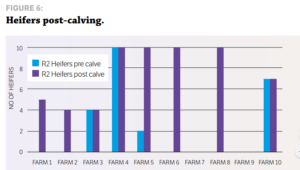 The average time from the estimated planned start of calving (PSC) to testing date was 41, 55 and 62 days for Oamaru, Dunsandel and Ashburton respectively. 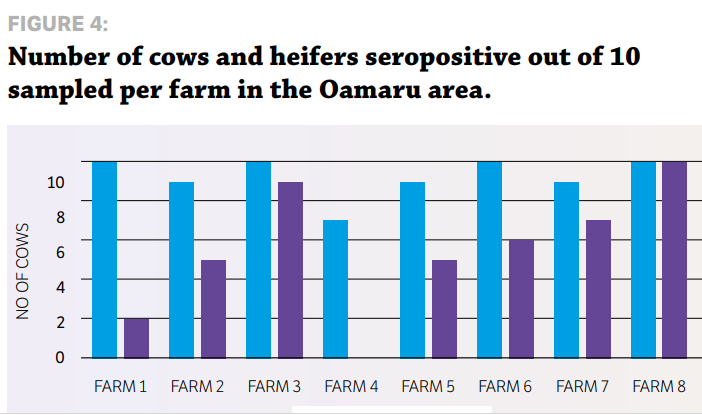 There was a positive correlation for the time of testing from the PSC, which suggests why fewer heifers were seropositive in Oamaru. They were tested closer to the PSC, so had less exposure time, hence less seroconversion. 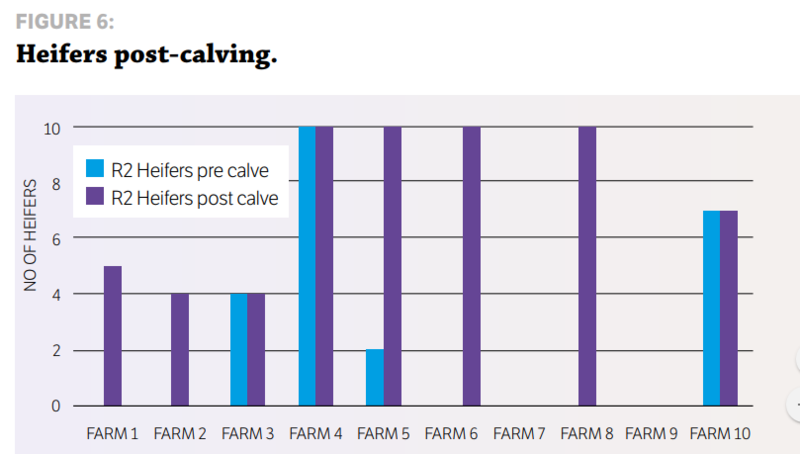 Individual farm data also suggested a positive correlation for the length of time after PSC and testing and the number of heifers seropositive. These results, while limited in numbers, indicate potentially higher levels of exposure than previous studies have shown, particularly in the South Island. 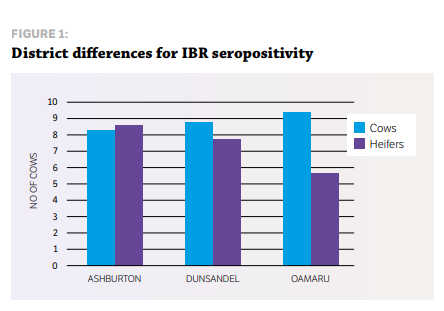 IBR infections in dairy herds in Canterbury and North Otago appear to be extremely widespread, with 100% of herds surveyed having at least 60% of cows seropositive for IBR antibodies. This leads to the question of what happens with heifers as they enter the herd, as the results suggest naïve heifers may become infected. Agilis investigated this in 2016 by sampling R2 heifers from herds serviced by VetSouth in Southland. 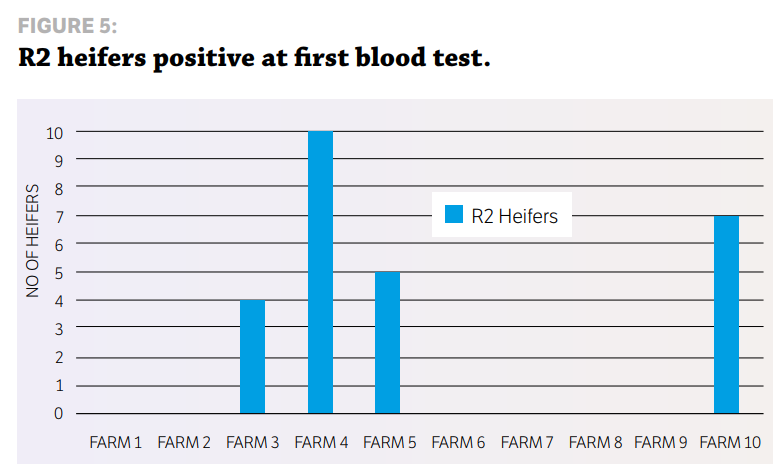 STUDY DESIGN Ten random R2 heifers from 10 dairy herds serviced by VetSouth were blood-tested for IBR during May and June 2016, before they calved and while they were in a separate herd at their runoff. Serum was collected in a vacutainer using a clean needle for every heifer. The serum samples collected were analysed at Gribbles Veterinary in Christchurch for IBR antibodies using the IBR ELISA. Once calved and mingling with the whole herd, the same heifers were re-bled and their serum again tested for IBR antibodies. The blood testing was carried out during routine farm visits for mineral testing of cattle. 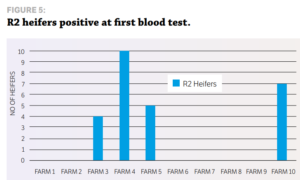 RESULTS Heifers on four of the 10 farms were positive for IBR antibodies, with seropositivity ranging from 40% to 100%. Six of the 10 farms had no sign of exposure at all. This fits with historical testing of export heifers, where, due to the highly infectious nature of IBR, infection tends to be either widespread or not there at all. This study supports the Vetlife results that heifers appear to be largely naïve entering the dairy herd and have the challenge of dealing with clinical disease at the same time they are adjusting to lactation and all of its associated rigours. No meaningful work has been done in New Zealand quantifying the effects of IBR in dairy herds, although Neilson and Grace (1988) describe rapid drops in milk production of 10 to 18 litres a cow per day and body weight losses of up to 50kg. They cite one outbreak in calves where 48 out of 250 calves either died or had to be destroyed due to a brain infection resulting from IBR. In the UK, Statham et al (2015) showed a significant milk production loss in cows subclinically infected with IBR compared to cows not infected. A clinical outbreak of IBR may be relatively easy to detect, but it is clear that most herds are running with a large proportion of cows that are subclinically infected. Clinical cases are the proverbial tip of the iceberg, with many more animals subclinically infected that are insidiously eating away at production. This suggests that veterinarians should recommend using tools such as vaccination to help reduce the cost of IBR to the New Zealand dairy farmer. THESE RESULTS, WHILE LIMITED IN NUMBERS, INDICATE POTENTIALLY HIGHER LEVELS OF EXPOSURE THAN PREVIOUS STUDIES HAVE SHOWN, PARTICULARLY IN THE SOUTH ISLAND. REFERENCES: Fastier LB, Hansen NF. The occurrence of antibodies to bovine virus diarrhoea, infectious bovine rhinotracheitis and parainfluenza virus in sera from New Zealand cattle. New Zealand Veterinary Journal 14, 27–32, 1966 Motha MXJ, Hansen MF. Prevalence of IBR, PI 3, BRS and BCV infections in the dairy cattle population of New Zealand. New Zealand Veterinary Journal 46, 239–240, 1998 Neilson FJA, Grace PJ. Infectious bovine rhinotracheitis widespread in New Zealand. Surveillance 15(2), 29, 1988 Statham JME, Randall LV, Archer SC. Reduction in daily milk yield associated with subclinical bovine herpesvirus 1 infection. Veterinary Record 177(13), 339, 2015. ACKNOWLEDGEMENTS: The Vetlife work was undertaken by Matt Hart and his colleagues from Vetlife Dunsandel, Ashburton and Oamaru. The VetSouth work was undertaken by Hayden Dore and his colleagues from VetSouth. All laboratory work was carried out by Gribbles Veterinary Christchurch.